Sorry... the 2017 Nissan Altima is no longer being sold as new. Instead, take the first step to a great deal on 2019 Nissan Altima with a free price quote! 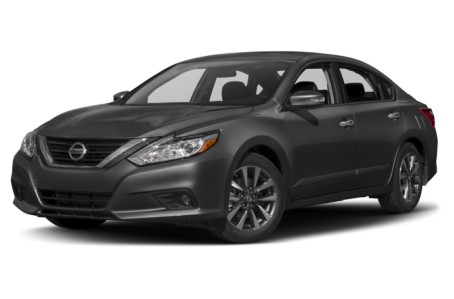 The 2017 Nissan Altima is a mid-size sedan that seats 5 passengers. It competes with the Honda Accord, Toyota Camry, and Hyundai Sonata. This year, it remains largely unchanged. Five trims are available: the base model, S, SR, SV, and SL. Like the Maxima, the Altima has unconventional looks to compete in a crowded, mid-size sedan segment. It has wild-looking, jagged headlights and sporty front and rear fascias. It utilizes active grille shutters that can close at higher speeds for better performance and fuel efficiency. Standard features include a dual-pipe exhaust system, power side mirrors, and 16-inch wheels. Available features include LED headlights, heated side mirrors, turn signal indicators at the side mirrors, a rear spoiler, a power moonroof, and larger 17- or 18-inch alloy wheels. Under the hood, the Altima is powered by a standard 179-hp, 2.5-liter 4-cylinder engine mated to a continuously variable automatic transmission (CVT) and front-wheel drive. The SR and SL trim levels have an available 270-hp, 3.5-liter V-6 paired to the same transmission. Fuel economy for the 4-cylinder model is an EPA-estimated 27/39 mpg city/highway. It lowers to a 22/32 mpg rating for the V-6 model. The SR model gets sport-tuned suspension that lowers body roll by 20-percent. Inside, the Altima has a redone center console, more soft-touch materials in the cabin, and added technology. The same “zero-gravity” seats that Nissan says are inspired by NASA technology are back, which are softer than most seats found in the segment and pretty comfortable. Bluetooth connectivity (including audio streaming) is standard, along with a 60/40-split folding rear seat, air conditioning, and keyless entry. Also available are plenty of tech options, including satellite radio, USB/iPod port, a navigation system with a seven-inch screen, and NissanConnect, which has a Hands-Free Text Messaging Assistant. A 5-inch touchscreen is standard for most models above the Base, with a larger seven-inch screen also available. Standard safety features include six airbags, antilock brakes, and an electronic stability system. Available features include a blindspot monitoring system, lane departure warning, and rear sensors that can detect moving objects while reversing. Predictive Forward Collision Warning is also available, which can actually read the traffic ahead of the Altima and warn the driver of potential collisions. 92 of 95 (96%) consumers said they would recommend this vehicle to a friend.